Ok, so since September (through correspondence on my facebook page) I’ve been taunting y’all with a promise that someday soon I was going to write a blog post explaining what I’ve been up to that has slowed me down in the blog-posting department. Well, “someday soon” has finally arrived and I’d like to make my first post addressing the “slow down” but before I do, I just really quick want to thank you for your continued support through all the comments, tweets, pins, stumbles and referrals. All that LOVE kept this blog alive and even helped it grow. Thank you! Thank you! Thank you! Now…. let me tell you about what’s been keeping me. Often I hear folks talking about “filling their bucket”. When I hear this, I think of a bucket that rests near a fountain that is used to gather water that can be used in case the fountain (from which it is filled) runs dry and there is no water to be had. The bucket holds enough water (i.e. goodness) to provide what is needed until the fountain flows again. Well, I have a [figurative] bucket and in it I keep all the goodness I can catch. Truth, happiness, joy, love, giggles, hugs, kisses, laughter, experiences, memories, goals & hope…if it’s good, it goes in my bucket. My bucket has never failed me. It has always held the sweet refreshment I needed, exactly when I needed it, until late last summer (2011). Being wise (like I so often am) I decided that even thought the fountain was still flowing I should go and check on my bucket…you know, just to make sure it was filled and prepared for when I needed it. Well, when I took a peek inside, I was a bit astonished. There was nothing in it. It was completely empty. “Someone must be taking my goodness.” I thought. “Oh well, I’ll just fill it back up.” So I pushed it under the full stream of the fountain. When I thought the bucket should be close to full, I took a second glance inside. That is when I began to panic (just a little). My bucket wasn’t holding water! First, I tried to fill it up, again. When that didn’t work I thought that maybe the integrity of my bucket had been compromised so I began to inspect it for holes or leaks. When I found none, full on panic ensued. WHY WOULDN’T MY BUCKET HOLD WATER? WHAT WAS I GOING TO DO WITHOUT A PROPER BUCKET!? Quickly, I decided to put my bucket down and take a step back in order to give myself some distance to either calm down or get some perspective in order to see if there was something I had missed. With each step backward the problem became increasingly clear. It wasn’t that there was a leak or a hole; it was that my bucket wasn’t a bucket…. I decided to stick with the fountain I was familiar with and set out to find a bigger bucket. In a frantic effort to find what I was looking for I called everyone I knew who I thought might know anything about buckets or might have one for me to borrow until I could find my own. It seemed my peace was dependant on finding something big enough and sturdy enough to hold the goodness that came from the fountain. Finally, after making a colossal mess from pulling everything off of my shelves, out of storage and from the places I go to look for lost things....I found what I was searching for. I can now report that what I found holds water very well. Now, not wanting to repeat this event anytime in the future, I have decided to keep my eye out for bigger and sturdier buckets - you know, just in case there comes a day when the pressure of the fountain is turned up again and the bucket I have is no longer enough to hold what it needs to. When that happens, I’ll know exactly where to go to replace it. The only real problem I have now (beside the mess that I made that I may never be able to clean up) is that I can’t get the goodness out as fast as it’s coming in, so it often… runneth over! Thanks again everyone for sharing your goodness with me through this phase in my journey when I thought I had none. Now get out your blender (a Blendtec if you have it) and blend up a delicious, healthy Green Monster so that we can raise our “cups” to the New Year. May this year be filled with enough goodness to share with everyone. May our world view be big enough to find goodness in every relationship. May our minds be open to new information and may our hearts allow us to receive it. Place all the ingredients into the Blendtec, hit the smoothie button and when it’s done, ENJOY! Place the ingredients into your blender in the following order: 1) chia seeds, 2) spinach, 3) banana, 4) milk. The reason for this order is so the heavier ingredients weigh down the chia seeds and spinach and keep it from flying up around the blender and sticking to the side. Blend everything on the highest setting for 1 minute or so. Finally, add ice and blend on the ice setting. Pour into a large glass. Source: Slightly adapted from Angela at Oh She Glows and Green Monster Movement. What a great story, I was anxiously waiting to find out the purpose of the bucket. I kept getting closer and closer to the screen, like reading a mystery . Loved it!! I'm glad you liked it @Fried Green Aprons (I hope it wasn't too cryptic). I love the parable. I'm glad your bucket is full once again. Have a blessed week! So glad to see a post with good news! Someday I would like to hear more! Until then.... what the heck is a chia seed? Great story, great ending. So glad you found a bucket, and that it's full. You're awesome. Such a beautiful way to express yourself, glad you bucket is full and happy :) Delightful drink! 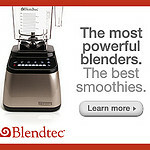 Waiting for more Blendtec goodness so I can have recipes to try with my ninja blender. @Trisha T, a chia seed comes from a desert plant that grows in southern Mexico. They have long been known for their health benefits and were used as a basic survival ration for Aztec warriors. Today, they are used for their high amounts of omega-3 fatty acids. They are a better source of these fatty acids than flax seeds and are also very high in antioxidants. For more information about natural health supplements, check out my website: NutritionLifestyles.com.